One of the benefits one of the benefits of Mortech Product and Pricing Engine (PPE) is the ease of quoting new and unique products for your borrower scenarios. We wrote earlier on this blog about Cashout products, and how offering them can provide new avenues for young borrowers with student loan debt. Being able to offer more niche products for unique scenarios is a big way for you to get ahead of the competition in terms of what sets you apart from the rest. 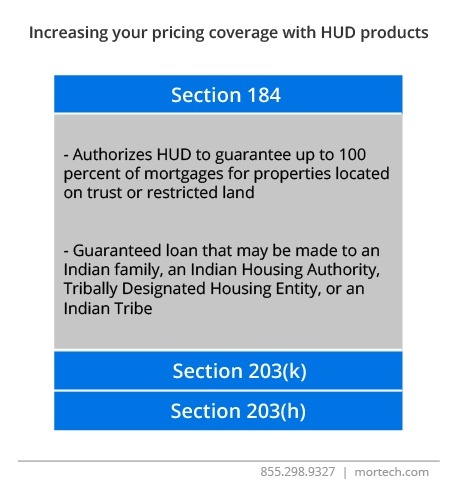 One such product is Section 184, which authorizes HUD to guarantee up to 100 percent of mortgages for properties located on trust or restricted land or land located in an Indian or Alaskan Native area. These guaranteed loans may be made to an Indian family who will occupy the residence at their primary home, and Indian Housing Authority or Tribally Designated Housing Entity, or an Indian Tribe. Loans guaranteed under section 184 are considered safe harbor qualified mortgages that meet ability-to-repay requirements. There are currently 37 states in which a section 184 can be used, most of which are eligible in their entirety. Another HUD product, Section 203(k), is used to rehabilitate one to four-unit structures used primarily for residential purposes. The product allows for a borrower to rehabilitate a structure and refinance the debt, or to purchase and rehabilitate a structure. Underwriting requirements mostly follow those of the 203(b). The 203(k) can be used in conjunction with the 203(h), the Energy Efficient Mortgage, or Solar and Wind Technologies. A borrower may finance up to 97.75 percent of their value of the property with FICOs at or above 580. Those with lower FICO scores are limited to an LTV of 90 percent. Second homes require a maximum LTV of 85 percent. 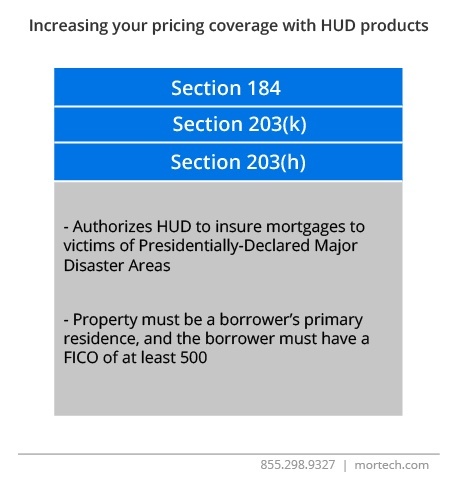 One final HUD product, Section 203(h), authorizes HUD to insure mortgages to victims of Presidentially-Declared Major Disaster Areas (PDMDA) for the purchase and reconstruction of a Single-Family Property, or a unit in a FHA-approved condominium project. Underwriting requirements mostly follow those of the 203(b), the property must be a borrower’s primary residence, and the borrower must have a FICO of at least 500. The property also must have been destroyed or damaged to such an extent that replacement or reconstruction is necessary. When used in conjunction with the 203(b), the maximum LTV is 100 percent of the adjusted value however, when used with a 203(k), the 203(k) LTV applies. 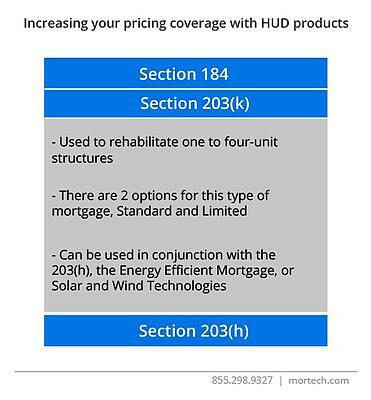 These are just a few lesser-known HUD products that can increase and diversify your product coverage, are available to price directly within Mortech’s PPE, and allow you to offer better and more fitting solutions for your borrowers. To find out more about Mortech’s supported investors and their products, and how our mortgage pricing engine can improve your business, contact us today for a short, free demo.